Hysteresis Brake Dynamometers (HD series) are versatile and ideal for testing in the low to middle power range (max. 14 kW intermittent duty). Hysteresis Brakes do not require speed to create torque, and therefore can provide a full motor ramp from free-run to locked rotor. Brake cooling is provided by convection (no external source) or by air (compressed air or dedicated blower) depending on the model. Hysteresis Dynamometers have both continuous and intermittent power ratings where the dynamometer is capable of dissipating more power for shorter periods of time. All Hysteresis Dynamometers have accuracy ratings of ±0.25% to ±0.5% full scale, depending on size and system configuration. 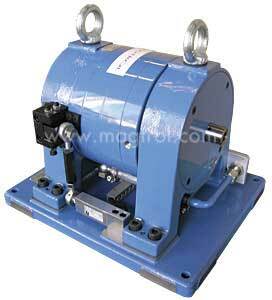 Also available are special designs for high-speed motor testing. Magtrol’s new Micro Dyne is the FIRST and ONLY system designed specifically for testing miniature/micro, low-torque motors. Used for testing internal combustion engines up to 10 horsepower (7.5 kW). Simple to use, reliable, and lower cost dynamometers for manual motor testing. Eddy-Current Brake Dynamometers (WB series) are ideal for applications requiring high speeds and also when operating in the middle to high power range. Eddy-Current Brakes provide increasing torque as the speed increases, reaching peak torque at rated speed. 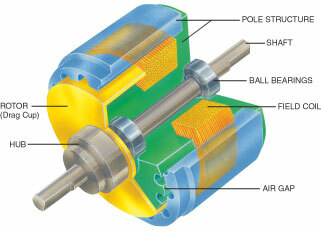 The Dynamometers have low inertia as a result of small rotor diameter. Brake cooling is provided by a water circulation system, which passes inside the stator to dissipate heat generated by the braking power. The water cooling in the WB provides high continuous power ratings (max. 140 kW). The WB Dynamometers have typical accuracy ratings of ±0.3% to ±0.5% full scale, depending on size and system configuration. Powder Brake Dynamometers (PB series) are ideal for applications operating in the low to middle speed range or when operating in the middle to high torque range. Like Hysteresis Brakes, Powder Brakes provide full torque at zero speed. Like the Eddy-Current Brake Dynamometers, the PB series is water-cooled, allowing for power ratings up to 48 kW. The PB Dynamometers have typical accuracy ratings of ±0.3% to ±0.5% (±2% for PB 2.7) full scale, depending on size and system configuration. 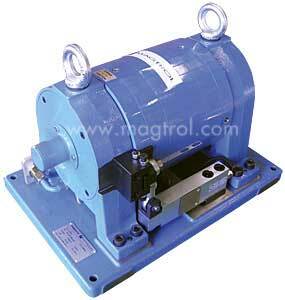 Magtrol offers Eddy-Current and Powder Dynamometers mounted in tandem. In tandem, the unique features of each type of dynamometer brake are utilized, allowing nominal braking torque to be applied to the unit under test from zero speed to maximum rotation. The Tandem Dynamometers are available on a number of PB/WB combinations.